Attitudes toward and knowledge of medical cannabis among individuals with spinal cord injury. 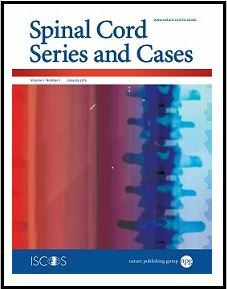 “An observational study based on an online survey addressing attitudes toward and knowledge of cannabis among people living with spinal cord injury (SCI). Participants largely believed that cannabis use is safe, has potential therapeutic benefits, and ought to be legal. “This study aimed to evaluate pain and its symptoms in patients with failed back surgery syndrome (FBSS) refractory to other therapies, treated with a combination of delta-9-tetrahydrocannabinol (THC) and cannabidiol (CBD), in association with spinal cord stimulation (SCS). Results: Effective pain management as compared to baseline result was achieved in all the cases studied. The positive effect of cannabinoid agonists on refractory pain was maintained during the entire duration of treatment with minimal dosage titration. Pain perception, evaluated through numeric rating scale, decreased from a baseline mean value of 8.18±1.07–4.72±0.9 by the end of the study duration (12 months) (P<0.001). “Huo and colleagues elegantly demonstrate that the endogenous cannabinoid system can be modulated to provide neuroprotection in ischemic injury of the spine. Cannabis shenanigans: advocating for the restoration of an effective treatment of pain following spinal cord injury. “Cannabis is an effective treatment for pain following spinal cord injury that should be available to patients and researchers. The major argument against the rescheduling of cannabis is that the published research is not convincing. This argument is disingenuous at best, given that the evidence has been presented and rejected at many points during the political dialog. Moreover, the original decision to criminalize cannabis did not utilize scientific or medical data. There is tension between the needs of a society to protect the vulnerable by restricting the rights of others to live well and with less pain. It is clear that this 70-year war on cannabis has had little effect in controlling the supply of cannabis. People living with chronic pain should not have to risk addiction, social stigma, restrictions on employment and even criminal prosecution in order to deal with their pain. The enigma of cannabis use in spinal cord injury. “Cannabis use in medicine continues to confound practitioners. There is confusing interpretation of the efficacy and adverse event data, highlighting the complexity of this unique plant. The non-psychoactive phytocannabinoid cannabidiol (CBD) attenuates pro-inflammatory mediators, T cell infiltration, and thermal sensitivity following spinal cord injury in mice. “We evaluated the effects of the non-psychoactive cannabinoid cannabidiol (CBD) on the inflammatory response and recovery of function following spinal cord injury (SCI). Female C57Bl/6 mice were exposed to spinal cord contusion injury (T9-10) and received vehicle or CBD (1.5 mg/kg IP) injections for 10 weeks following injury. The effect of SCI and CBD treatment on inflammation was assessed via microarray, qRT-PCR and flow cytometry. Locomotor and bladder function and changes in thermal and mechanical hind paw sensitivity were also evaluated. There was a significant decrease in pro-inflammatory cytokines and chemokines associated with T-cell differentiation and invasion in the SCI-CBD group as well as a decrease in T cell invasion into the injured cord. A higher percentage of SCI mice in the vehicle-treated group (SCI-VEH) went on to develop moderate to severe (0-65.9% baseline thermal threshold) thermal sensitivity as compared with CBD-treated (SCI-CBD) mice. CBD did not affect recovery of locomotor or bladder function following SCI. The nonpsychotropic cannabinoid cannabidiol modulates and directly activates alpha-1 and alpha-1-Beta glycine receptor function. “Loss of inhibitory synaptic transmission within the dorsal horn of the spinal cord plays a key role in the development of chronic pain following inflammation or nerve injury. Inhibitory postsynaptic transmission in the adult spinal cord involves mainly glycine. Cannabidiol is a nonpsychotropic plant constituent of Cannabis sativa. As we hypothesized that non-CB receptor mechanisms of cannabidiol might contribute to its anti-inflammatory and neuroprotective effects, we investigated the interaction of cannabidiol with strychnine-sensitive alpha(1 )and alpha(1)beta glycine receptors by using the whole-cell patch clamp technique. Cannabidiol showed a positive allosteric modulating effect in a low micromolar concentration range (EC(50) values: alpha(1) = 12.3 +/- 3.8 micromol/l and alpha(1)beta = 18.1 +/- 6.2 micromol/l). Direct activation of glycine receptors was observed at higher concentrations above 100 micromol/l (EC(50) values: alpha(1) = 132.4 +/- 12.3 micromol/l and alpha(1)beta = 144.3 +/- 22.7 micromol/l). “Remote ischemic preconditioning (RIPC) has protective effects on spinal cord ischemia reperfusion (I/R) injury, but the potential mechanisms remain unclear. In our study, the effects and underlying mechanisms of RIPC on blood-spinal cord barrier (BSCB) breakdown following I/R injury were investigated. RIPC attenuated the motor dysfunction, BSCB disruption and downregulation of occludin after I/R injury, which were impaired by blocking CB1 and CB2 receptors. Moreover, RIPC upregulated the elevated perivascular expression of CB1 and CB2 receptors following I/R injury. “Spasticity in chronic spinal cord injury is a condition that can have negative repercussions on the patient’s quality of life. Its treatment is complex and sometimes the outcome is insufficient. Cannabinoids have recently been used in multiple sclerosis to successfully treat spasticity that is refractory to other therapies. To quantify the clinical response of a group of patients with spastic chronic spinal cord injury to the orally administered drug delta-9-tetrahydrocannabinol-cannabidiol (Sativex ®) as medication for use in special situations. Fifteen patients took part in this study. A significant improvement was observed on three of the scales recorded: modified Ashworth scale (z = -2.97; p = 0.003), Penn spasm frequency scale (z = -2.76; p = 0.006) and Numeric Rating Scale (z = -3.21; p = 0.001).